Sunward Steel was proud to supply a prefabricated metal building to Gallatin River Ranch in Manhattan, Montana in May of 1998. 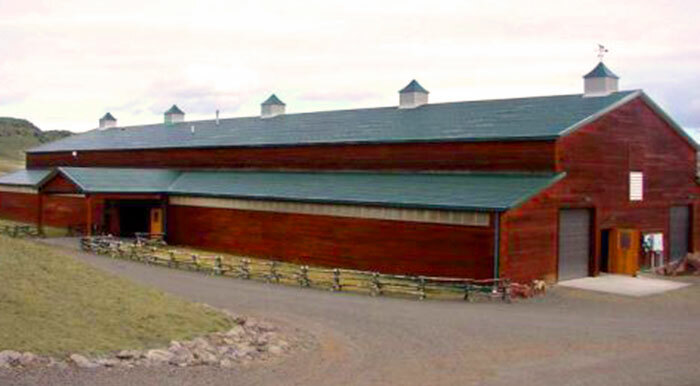 Gallatin Ranch needed a sturdy structure for a horse arena and equestrian center. The center provides boarding services to horse owners. It includes covered indoor and outdoor areas and a spacious pasture. The team needed ample room for their operation as they also offered horse training and lessons to the general public. Situated comfortably in the western landscape, the owners needed a facility that would blend well with the natural surroundings. Sunward took into account the upscale neighborhood, 20-acre views, fishing access, hiking trails, and location to the city when designing a metal building for their needs. Gallatin Ranch chose a Gold Seal brand structure with a dark green roof and trim. The building is 140’x240’x24 with a 3:12 roof pitch. The pre-engineered facility is made to withstand 90 mph winds and harsh weather elements. Considering purchasing a pre-engineered metal building for commercial or industrial use in Montana or another part of the country? Click here for a price quote.